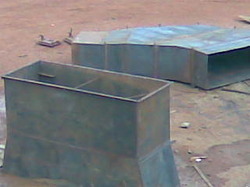 Design,detail engineering,fabrication supply & exporter of boiler structure, ducting, hopper, buck stay, railing & grating etc. Boiler Structure offeredfeature precision designed &fabricated finish o as to provide efficient support in precisely handle the involved operations demands in a working industrial unit. Available in stainless steel constructed finish, these structures find use in industry sectors like power plant, steel mill, petrochemical fields and others. 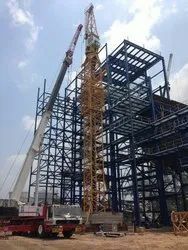 Some of our strengths in this field include extensive experience in design, manufacturing and installation of boilers, durable construction for resisting strong earthquake, safe & easy to install and disassemble, come with optimum insulation support, provide for high savings on energy, option of developing according to customer's drawings. MS Ducting offered is part of industrial boiler accessory and provides support as water cooling wall. The presence of dense water-cooled tubes finds use in processes involving high temperature flue gas purification and come developed using latest water cooling technology so as to provide for optimum performance support. Some of its features include large heat transfer area of unit length, capability to bear high pressure, providing for stable running support, long service life, choice of development as per drawings/designs submitted by customers among others.